Sudan: West Promoting War, Israel Providing Arms, Bankers Peddling "Human Rights"
Following the United Nations’ recent approval of Resolution 2046 threatening the nations of Sudan and South Sudan with sanctions , the success of international attempts at conflict aversion in the region appear to be in question. Hostilities between the two nations have climaxed since South Sudanese forces captured the region of Heglig, an oil-producing site 70 kilometers into Sudanese territory . South Sudanese forces have also maintained a presence in the long disputed border region of Abyei in Southern Kordofan, where Juba has recently vowed to withdraw its personnel from . Although Khartoum has agreed to comply with the United Nations resolution, it has vowed to continue military operations against South Sudan’s troops as long as they remain within the territory of Sudan, “Sudan has declared its commitment to a United Nations resolution calling for an end to military operations, but the other side’s troops still remain on our territory; they have occupied two districts and have not stopped their hostile actions” . As Juba denies Khartoum’s claims of occupying Sudanese territory, South Sudan’s newly released official map includes the Heglig region and six areas that are “contested and occupied” by Khartoum . Amid the escalating regional tension, China has recently offered South Sudan an $8 billion development package set to allocate funds for road construction, hydropower, infrastructure and agricultural projects following South Sudanese President Salva Kiir’s visit to Beijing . China has traditionally been a key partner to the government in Khartoum, but has steadily increased its influence in South Sudan since its independence in 2011, primarily through investments via state-owned Chinese oil companies China National Petroleum and Sinopec. As inflation rates in Sudan reportedly rise to 21% following increased military expenditure since clashes erupted with Juba in late March 2012 , China’s extensive economic engagement in the region offers the leverage needed to potentially play the role of a mediator in the Sudanese conflict. The emergence of South Sudan as an independent state came at a heavy price for Khartoum, as an estimated 85% of the country’s oil production came under Juba’s control. Although South Sudan holds a majority of oil reserves, Juba has relied on the Greater Nile Oil Pipeline for its oil exports, a pipeline operated by the China National Petroleum Corporation (CNPC) extending to Port Sudan on the Red Sea via Khartoum . Under a barrage of economic sanctions, Khartoum sought to implement oil transit fees for the use of the Greater Nile Oil Pipeline, by charging Juba around $36 per barrel; Juba holds over $11 billion in oil transit debt and has refused the figures proposed by Khartoum, prompting Juba to suspend its oil production . Juba has accused its northern neighbor of launching air strikes on its territories, while both sides also accuse each other of backing rebel militia, claims that Khartoum has denied . Following the fiery rhetoric espoused by Sudanese President Omar al-Bashir describing Juba’s ruling Sudan People's Liberation Movement as “insects,” Bashir now concedes, "We look with wisdom and foresight to well-established relations between us and the people of South Sudan" . As a climate of uncertainty persists beneath irresponsibly bellicose exchanges, the implementation of a campaign to unseat Omar al-Bashir and bring down the government in Khartoum has long been underway. 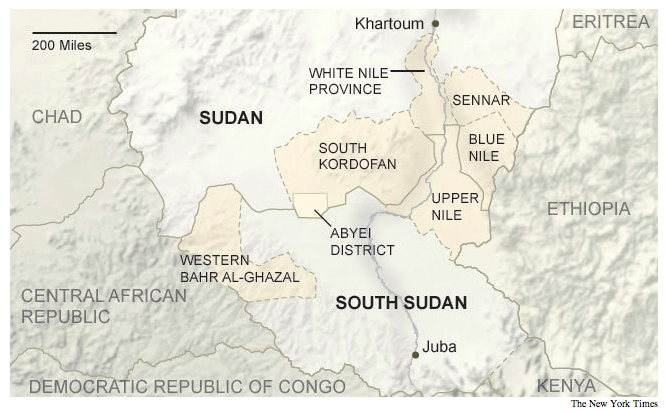 A recent Op-Ed published in The New York Times by Dr. Gérard Prunier entitled “In Sudan, Give War a Chance” reflects a predominately Western political school of thought which favors the prospect of full scale war to bring about regime change in Sudan. 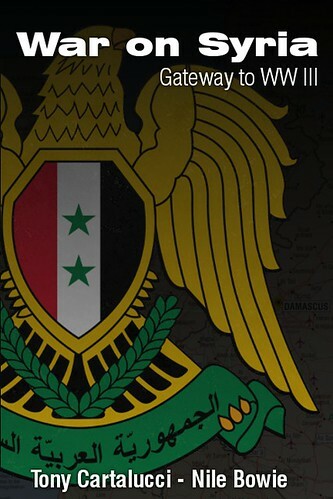 Prunier laments, “The international community has called for a cease-fire and peace talks, but the return of violence is not necessarily a bad thing,” before concluding “an all-out civil war in Sudan may be the best way to permanently oust Mr. Bashir and minimize casualties” . Sudan’s Omar al-Bashir is the first sitting head of state to be charged with genocide by the International Criminal Court (ICC) for crimes against humanity conducted in Sudan’s western Darfur region; ICC prosecutor Luis Moreno-Ocampo accuses Bashir of keeping millions of refugees in an environment resembling a “gigantic Auschwitz” . Violence and infighting in Sudan has traditionally been a product of tension along ethnic lines, more so than religious differences. Although the modern Sudanese state has been divided along ethno-religious lines with the religiously Islamic and ethnically Arab government in Khartoum split from the ethnically African and religiously Christian government in Juba, tribal minorities such as the ethnically African and religiously Islamic Fur and Zaghawa groups in Sudan’s western Darfur region have long demanded reparations for the marginalization they’ve experienced from Khartoum . In a recent report issued by Amnesty International entitled “Sudan: No End to Violence in Darfur,” the organization attributes China, former Soviet Union countries and Belarus for selling arms to the Government of Sudan. Amnesty International’s report omits any mention of Israel, who has reportedly provided heavy military logistical support to the Justice and Equality Movement (JEM), Darfur's most powerful armed rebel group . 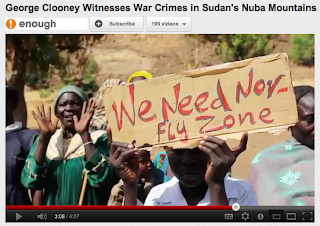 Although the United Nations does not recognize the conduct of the Sudanese government in Darfur as “genocide” , mass media campaigns publicizing the alleged violence in Sudan have been embraced by celebrity personalities such as George Clooney. 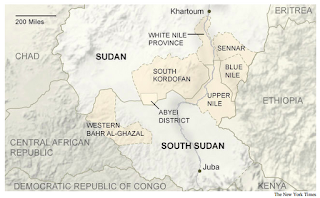 TIME magazine warns of the increased prospects for genocide in South Kordofan’s Nuba Mountains region, as rebels affiliated with South Sudan’s ex-rebel militia, the Sudan People's Liberation Army (SPLA) take up arms against Khartoum once again . Clooney has recently partnered with John Prendergast of The Enough Project to produce a promotional video depicting ethnic Nuba villagers displaying English language placards calling for the establishment of a “No-Fly Zone” and the prosecution of Omar al-Bashir by the International Criminal Court . The Enough Project was co-founded by US State Department Distinguished Service Award recipient John Prendergast and launched in 2007 under the Center for American Progress , an organization sponsored by billionaire investor George Soros and Peter Lewis of Progressive, a Fortune 500 insurance company, among others . John Podesta, who heads the Podesta Group, a Washington lobbying firm representing the interests of weapon-manufacturers Lockheed Martin and oil conglomerates such as British Petroleum , also chairs the Center for American Progress . In 2006, the Sudanese government barred 20,000 UN troops from running peacekeeping operations in Darfur, as then-Presidential Advisor Mustafa Osman Ismail argued that the UN mandate’s goal was the implementation of "regime change" in Khartoum . The sources of weaponry and covert assistance received by rebel groups in Sudan are rarely a subject of speculation among religious and political organizations who have long supported the international campaign to pressure Sudan. In 2007, the American Jewish World Service and the U.S. Holocaust Memorial Museum launched a “Save Darfur” coalition, which gained the support of adherents to intervention in Iraq, such as right-wing evangelical Christian groups and major organizational affiliates of the American Israel Public Affairs Committee (AIPAC) . According to The Jerusalem Post, the Save Darfur coalition launched a high-profile advertising campaign that included full-page newspaper ads, television spots and billboards calling for the imposition of a no-fly zone over Darfur with financial assistance the Jewish Community Center in Manhattan, United Jewish Communities, UJA-Federation of New York and the Jewish Council for Public Affairs . While the blame for violence in Sudan is laid squarely on Khartoum's shoulders, Israeli-led foreign elements have contributed to the training, financing, and arming of rebel militias and forces opposed to the Sudanese government within Sudan. Since 1969, Israel has reportedly trained recruits, shipped weapons, and offered support to South Sudanese SPLA rebels . Prior to South Sudan’s independence, Israel relied primarily on a flight route to Entebbe, Uganda to supply SPLA with weapons , however Tel Aviv now transfers missiles, military equipment, and even mercenaries to Juba quite openly . As Israel covertly operates in East Africa immune from international criticism following their bombing of Sudanese convoys in 2009 , the influence of Israeli think tanks such as The Institute for Advanced Strategic and Political Studies (IASPS) toward the creation of AFRICOM, the US Africa Command, remains a significant indication of the foreign policy directives being taken by Tel Aviv and Washington in Africa . The Sudan exists as sub-Saharan Africa’s third largest oil producer with over 6.6 billion barrels of proven oil reserves ; an estimated 85% of those reserves have been ordained to Juba, in the Republic of South Sudan . As China exists as Sudan’s largest trading partner by purchasing 40% of Sudan’s oil with the excess majority largely designated to Asian markets , reordering and monopolizing Sudan’s vast oil fields and mineral wealth is the capital incentive behind the unwavering support for the secession of South Sudan shown by US, EU, and Israeli officials. Members of the Sudanese opposition and various rebel separatist groups often visit Tel Aviv, Sudan’s main SPLA opposition even opened an office in Israel to promote its “policies and vision” in the region . In reflection of Israel’s active support for the Southern opposition, South Sudanese citizens were seen waving Israeli flags during their Independence celebrations in July 2011 . For the likely guarantee of support, the South Sudanese government in Juba applied for IMF membership in April 2011 before it had even officially gained independence from Sudan . As Israel and Washington offer their support to the Justice and Equality Movement (JEM) in Darfur and various rebel militias opposed to the Sudanese government, China’s interests in the region come under direct attack from these very rebel groups, most prominently in JEM’s October 2007 attack on the Greater Nile Petroleum Company in Defra, Kordofan . The World Bank has recently warned that South Sudan may collapse by its two-year anniversary, due to the ramifications of halting production of at least 75% of the regional oil in frustration with Khartoum's claims on oil-transit debt and revenue . Apparently, authorities in Juba are either unprepared politically for independence or lacking the appropriate guidance to effectively manage its internal affairs. In a recent meeting between Chinese Vice-President Xi Jinping and Sudanese Foreign Minister Ali Ahmed Karti, China urged the warring neighbors to settle their differences and negotiate . 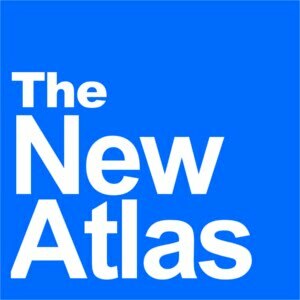 As China would prefer to align with its traditional approach of non-interventionist diplomacy, Beijing has an opportunity to exploit its influence in the region to not only further its own interests, but to defer criticism from parties loyal to Washington who credit China with sponsoring bloodshed through its business interests  and political positions . By pursuing the role of a mediator, China can preserve its interests by overseeing negotiations on trade regulations, citizens rights, demarcation and territory status between the neighboring Sudans’. As Juba depends on oil exports for 98% of its income , it must negotiate with Khartoum to settle its debts and agree on a mutual per-barrel fee for its use of the Greater Nile Oil Pipeline, as construction of a new pipeline from oil fields in South Sudan to a theoretical end point at the Kenyan port of Mombasa would take years to construct. While the current US Vice President Joseph Biden once called on the US to exert military force against Sudan , it remains crucial for the leaders of both Sudanese nation states to come to an agreement regarding the status of the Heglig region and other disputed areas claimed by both sides, lest peacekeeping forces internationally administer these contested zones. Any attempts at imposing an arms embargo throughout the Sudan would be entirely disregarded by both sides, which are already adequately armed. While attempts to rally public support behind Western intervention in Sudan rely on emphasizing the human rights violations of Khartoum, claims of 6,000 people being slaughtered by Gaddafi used to justify NATO intervention in Libya remain unverified . Given the distinct ethno-religious differences of South Sudanese society and long history of striving for autonomy, their existence as a nation state is warranted. It is irresponsible to deny both Khartoum’s unwarranted and brutal treatment of civilians within its territory and the US-Israeli policy of inflaming national and regional antagonisms in Sudan by arming rebel militias, to the benefit of corporations seeking to control and develop oil fields and mineral deposits. While the allied powers in Washington and Tel Aviv would prefer to advocate aggressive policy to ensure against the survival of the regime in Khartoum, the institutional influence of Russia and China in the UNSC provides an opportunity for emerging powers to exert an alternative model of non-aggressive crisis aversion. China may thinly support future economic sanctions on the Sudans in hesitation to involve itself in the domestic issues of other nations, however Beijing could best exercise its influence by urging Khartoum to meet with tribal leaders to guarantee a ceasefire and develop a true federal system that would allow for local autonomy. As the Sudanese leadership in Khartoum projects itself as an Islamic nation, it should recall the final great address of the Islamic Prophet at Mount Arafat, who called for the rejection of social distinctions based on ethnicity and color.